The enrolled agent (EA) designation is a distinctive title that enhances the careers of accountants and professionals intending to specialize in tax. 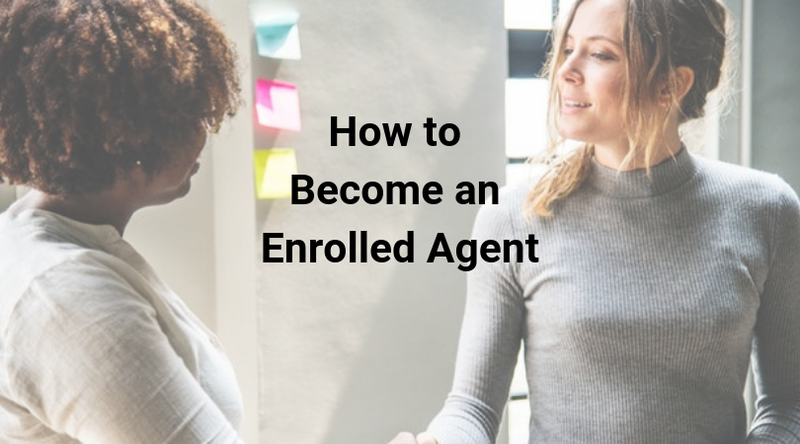 If you are interested in the EA, this 10-step guide about how to become an enrolled agent will lead you through each important decision and action on the way to the designation. The first 5 steps address choices you must make prior to application. Then, steps 6-10 cover the exam process. By following these steps, you can become an enrolled agent in 6-12 months. Step 1. Understand the Enrolled Agent Designation: What Is an Enrolled Agent? The first step ensures that you understand the EA designation. “Enrolled” means to be licensed to practice by the federal government. “Agent” means a person authorized to appear in the place of the taxpayer before the Internal Revenue Service (IRS). Therefore, enrolled agents are federally-licensed tax practitioners who possess technical expertise in taxation and the express privilege to represent taxpayers before the IRS in matters relating to examinations, collections, audits, and appeals. All 50 U.S. states recognize the EA credential. That’s because the U.S. Department of Treasury grants an EA with unlimited representative rights before all administrative levels of the IRS once the individual meets the EA requirements and passes the EA exam. The only other professionals who hold such status before the IRS are CPAs and attorneys. The National Association of Enrolled Agents (NAEA) shares more information about the definition of enrolled agents. Step 2. Identify the Benefits of Becoming an Enrolled Agent: Why Become an Enrolled Agent? The entire point of earning the EA is to reap the rewards of the designation. Enrolled agents don’t work for the IRS: they work for taxpayers. And their unlimited rights to represent taxpayers before the IRS really sets them apart from standard tax preparers. Consider how prestigious CPAs and attorneys are. They have a reputation for accounting and legal excellence because the process of landing these positions is demanding. In the tax preparation industry, EAs enjoy the same stature of quality and competence. Both the CPA and the EA certifications are licenses. Yet, the states grant the CPA, while the federal government grants the EA. For this reason, the tax expertise of enrolled agents is acknowledged at a national level. EAs are known across America as top-notch tax preparers. For this reason, with the EA designation, there’s really no arguing that you don’t know your stuff. Additionally, you can advise clients in matters involving multiple states. With this professional freedom, you can further solidify your understanding of complex tax issues and have the experience to prove it. So, EAs, CPAs, and attorneys hold the same good standing before the IRS. But in the eyes of the public, EAs are set apart from CPAs and attorneys because of their tax expertise and passion. Plenty of CPAs don’t prefer to take on taxation work either due to the nature of the job or a lack of confidence in their own abilities. Furthermore (sometimes, for that very reason), CPAs charge more for tax services. Everyone needs the aid of a tax expert at some point in their lives, so the demand for EAs is there. And with CPAs placing such a premium on their assistance, EAs appeal to the public with their advanced tax knowledge and their reasonable pricing. To truly commit the time, money, and effort the EA licensing process requires, you must really understand and value the tangible benefits of becoming an enrolled agent affords your career. Step 3. Compare the EA Designation to Other Certifications: Is the EA Right for You? The benefits of the EA designation may be enough to convince you to embark on the EA journey. But before you do, take the time to analyze the pros and cons of the EA to those of other professional qualifications. Then, select the one that best fits your interests and long-term goals. For example, would the CPA be a better choice for you? The CPA is a more well-known certification that also offers increased job opportunities, income, and incentives. Technically, CPAs can also experience greater increased earning potential over time. However, the CPA Exam is longer and more all-encompassing than the EA exam. You’ll also have to meet more requirements to earn the CPA. Therefore, you should learn more about the EA vs CPA so you can be completely sure of your designation path. Step 4. Perform a Cost-Benefit Analysis: How Much Does It Cost to Become an Enrolled Agent? Receiving and maintaining the enrolled agent designation is not free. Therefore, you must decide if you think the costs of the EA exceed the benefits. You also must consider the opportunity cost of the designation. To pass the exam, you must spend a lot of time and effort studying. Would preparing for the exam be too much to take on as you juggle your other roles and responsibilities? Learn more about the enrolled agent exam costs and the EA exam pass rates so you can decide. There are 2 paths you can take to the EA designation. Once you know for certain that you want to become an enrolled agent, you must select your path. Making this choice won’t be difficult. If you have never worked for the IRS, you really only have one option. Therefore, the rest of this guide explains how to become an EA by taking the EA exam. Officially called the Special Enrollment Examination (SEE), the EA exam will be the main hurdle to overcome on the way to the EA. Because good news: You don’t need any prior educational or professional experience to qualify for the Special Enrollment Examination. All you need is a Preparer Tax Identification Number (PTIN), which you can easily register for online. After you complete your online application, your PTIN will be available to you online. Registering online is easiest, but you can choose to fill out Form W-12 and mail it to the IRS. This method takes up to 6 weeks. Spending 6 weeks waiting for your PTIN could drastically cut into your overall EA exam progress. Therefore, you should definitely take the online approach. You should also know that a PTIN expires at the end of the year, so you must renew it by December 31 for the following year. Renewal open season usually begins each year in mid-October. Thankfully, the renewal process is quick and easy and doesn’t cost anything. Once you have your PTIN, you’re eligible to take the EA exam. There is no other application to fill out. Instead, you will simply provide your PTIN when you schedule an EA exam testing appointment and be allowed to make the appointment because you have a PTIN. I suggest that you start studying before you schedule your first exam date. I say this because you can only know when you will be ready to take the EA exam after you see how familiar you are with the exam content. To get the most accurate impression of your familiarity with the exam content, you must use an enrolled agent course. An EA review course will also help you deepen your knowledge of the material so you can be completely prepared to pass. To ensure you study regularly and to give you an idea of when you will finish your studies, you should make an EA exam study schedule. Once you’ve found the course that’s right for you, save on your EA exam prep by using my enrolled agent course discounts. Your EA exam study schedule will help you to see when you should be done studying. So, about 3 weeks before your review should conclude, schedule a testing appointment for the appropriate EA exam part. You don’t need to take the parts in sequential order. You can start with whichever part contains the content you are most familiar with or most interested in. Or, you can even choose to start with the part you think will be the hardest if you’d like to get it out of the way. I don’t recommend that you study for all 3 exam parts at the same time. You can do this, but it is a lot to take on and probably won’t help you pass faster. Therefore, I suggest preparing for one part at a time. Click the “Create an Account” button in the box labeled “I Want To…”. At this point, a login box will appear. On the right side of the box, you will see the “Create Account” link. Click this to set up your user ID and password. Then, go to your email box, click on the confirmation link, and activate your account. Log in and enter your personal information as requested. You should have your PTIN ready. Click “Save and Continue” to complete the registration. You can also choose to fax or mail in the application, but you can only register for the exam and schedule your appointment on the same day if you use the online method. Return to the Prometric IRS page. Click “Locate a Test Center” button in the “I Want To…” box. Select your country and state. Make your appointment selection (SEE Part 1 Individuals, SEE Part 2 Businesses, SEE Part 3 Representation, Practices, and Procedures). Search by entering your address, city, or zip/postal code. At this point, you can either check the availability of your preferred testing center or call the testing center to set up your appointment. If you check the availability, you can select a date on the calendar and click “Schedule an Appointment”. Click “Schedule My Test” in the “I Want To…” box. Follow the prompts to select your exam part, testing location, and appointment date. Pay the $181.94 test fee by credit card (you can pay with an electronic check if you schedule over the phone). Receive your confirmation number confirming your appointment. You should record and keep this number in case you need to reschedule, cancel, or change your appointment in any way. Before you schedule your exam, learn more about the Enrolled Agent exam dates and registration process. You should also read the EA exam candidate bulletin. To receive the enrolled agent license, you must apply for enrollment within 1 year of passing all 3 exam parts. You apply by filling out and submitting Form 23. You also must pay $30 online to the IRS. This process takes 60 days. If you do not take the exam and instead use your previous employment history with the IRS to earn enrollment eligibility, the application process will be a little different. You will need to submit extra information about your education, training, licenses, and work experience. Additionally, you will have to wait a little longer to finish the process. The former IRS employee review can take around 3 months. And just so you’re prepared, it could take longer. On either route to the enrolled agent designation, you will need to complete a background check. If you know your personal history has issues, take the initiative to alert IRS by listing the details in a disclosure statement. Then, submit this statement along with your application. Specifically, explain how the problem(s) originated, how it was corrected, and why it won’t happen again. Also, make sure you don’t have overdue tax charges before applying! It feels great to be a freshly minted EA. Nevertheless, in order to maintain your enrolled agent status, you can’t forget about the continuing education (EA CE) requirements. You must complete 72 hours of CE (16 hours minimum per year) every 3 years. At least 2 of your 16 annual hours must cover ethics. The process of becoming an enrolled agent may sound complicated. But once you take your first step, you’ll see that it’s completely doable. To learn even more about the enrolled agent designation, check out my enrolled agent blog. If you’d like me to answer specific questions about your situation, you can leave a comment or email me. Ready to jump into the enrolled agent designation process? Then sign up for my EA newsletter! I wish you the best of luck on your journey to becoming an enrolled agent! Stephanie thanks for your review of the EA review courses. It helped me make my final decision. Hi Stephanie, thank you so much for compiling all this practical experience information. I have no background whatsoever in taxes or accounting, as I loosely work for a NPO and my background is in the humanities. However, I am *strongly* thinking of a backup career in tax prep but am afraid of mistakes and liabilities. Becoming an EA sounds really good for giving me proper knowledge and licensing. I’m just curious, is being an EA strictly a seasonal post? Or could I conceivably get a year-round part-time job at an accounting firm for example, or even, if I have an HR job at another corporation, cite my tax specialties as reason for a raise or promotion? Thank you. The work is by nature seasonal but it’s definitely not a all or nothing type of schedule. There are work related to advisory (all year round) and to represent clients for IRD queries which is likely also not right at the busy season. As you become better, there are also advisory beyond personal tax, e.g. on estate, corporations and other more interesting and complex jobs. I am in the state of California; I have an EA review course I am studying and will be taking part I next month. Do I need any additional training because I’m in the state of CA; or will my review course be enough information. Thank you for your assistance. Thanks for the question. Your EA review course should cover US tax law — the US tax law isn’t really state-specific, so you don’t need any additional materials. Please let me know if you have any other questions.